The name of Ballade and her progeny have been frequently mentioned in various articles on this web-site. Her sire is Herbager, a very handsome stallion imported from France by Bull Hancock. The dark bay son of Vandale became a very successful stallion at Claiborne Farm. Herbager won six of eight races with one second place against the best of his generation. He claimed victories in the prestigious Prix Du Jockey Club and the Grand Prix de Saint-Cloud as well as the Prix du Prince d’Orange and the Prix Harcourt. He ended his career with a second place finish in the Prix de l’Arc de Triomphe on a broken pastern. Ballade was a dark bay bred in 1972 by Darby Dan Farm, and comes from a very good family. E. P. Taylor purchased her at the Keeneland yearling sales the following summer. Ballade’s pedigree shows a 5 x 5 cross to Teddy, one of which through La Troienne, a 4 x 5 to Blenheim II, one of which through Mahmoud, and a 5 x 5 cross to Mumtaz Mahal. Furthermore, her second dam Soaring by Swaps, is the dam of Mehmet (Monmouth Handicap) as well as multi stakes winner Miss Swapsco the dam of Ballade. Ballade was unremarkable on the race track as she was a modest winner of two races from eight starts. She placed second four times and third once. None of her starts were stakes races. She was retired to Taylor’s broodmare population in Oshawa and then bred to his new stallion Halo. 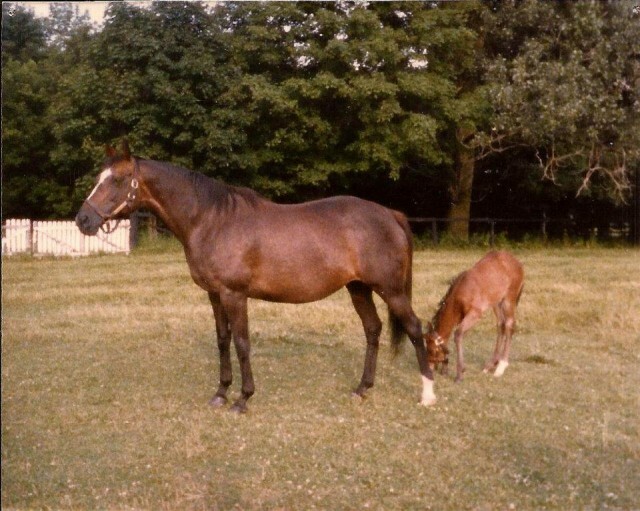 Ballade got off to a spectacular start to her broodmare career with her first foal, a daughter from this mating with Halo. The foal in question is Canadian Hall of Fame member Glorious Song. Glorious Song was a top class race mare. Purchased as a yearling by Frank Stronach, she won her only start as a two year old. As a three year old she won the Belle Mahone Stakes and the Maple Leaf Stakes under trainer Fred Loschke’s care. For the 1980 season Stronach transferred Glorious Song to Gerry Belanger’s barn, who conditioned her to six stakes victories. The Dominion Day Handicap, Canadian Maturity, Michigan Mile and One-Eighth, Top Fight Handicap, La Canada Stakes and the Santa Margarita Handicap. This list of wins for the season would result in Glorious Song being named the Eclipse Award Champion Older Female in North America as well as the Sovereign Award for Horse of the Year in Canada. Stronach later sold a half interest to Nelson Bunker Hunt in 1981 and she was subsequently transferred to her third trainer, John Cairns. Glorious Song repeated her victory in the Dominion Day Handicap against the boys, and also won the Spinster Stakes and Santa Maria Handicap. She retired from racing with a record of seventeen victories and nine second place finishes from thirty-four starts. Glorious Song was the first Canadian bred to earn over $1 million lifetime. Glorious Song then become a glorious broodmare. She produced two outstanding colts in Singspiel by In The Wings and Rahy by Blushing Groom. In addition, she is the dam of multi stakes winner Rakeen and three daughters who each produced a G1 stakes winner. Hunt had purchased Stronach’s share in her when she retired from racing. He later sold her to Hill ‘N Dale Farm after her fist foal, stakes placed Rivotius by Riverman. Hill ‘N Dale sold her to Sheikh Mohammed in 1988 while in foal to Blushing Groom. Sheikh Mohammed had previously purchased Rahy as a yearling and was keen to acquire Glorious Song and the full sibling foal to Rahy she was carrying. The Blushing Groom foal would be a filly to be named Morn Of Song. A modest winner of three races from seven starts, she later produced group one winner Mezzo Soprano (Prix Vermeille). Another daughter of Glorious Song, Ring Of Music became the dam of Campanologist (Preis von Europa, Deutschland Preis, Jockey Club Italiano etc). Glorious Song’s third daughter named Chansonnette is the dam of Danon Chantilly (NHK Mile Cup). It is through Singspiel and Rahy where Glorious Song has taken her place among the elite broodmares of recent time. Singspiel won grade/group one races in four countries. He travelled the globe to win the Canadian International, Japan Cup, Dubai World Cup, and in England the Coronation Cup and International Stakes. He finished second in the Breeder’s Cup Turf run at Woodbine. Singspiel was a popular horse with Canadian racing fans, no doubt due to him being a son of Glorious Song. There is currently a grade three turf race in his name run at Woodbine every year. Rahy became a sire of considerable importance, ensuring the names of Glorious Song and Ballade in future pedigrees. He sired ninety-one stakes winners, fourteen of which were grade/group one winners. Fantastic Light, Dreaming of Anna, Serena’s Song, Noverre and Mariah’s Storm are his most notable get. Mariah’s Storm is the dam of current world class sire Giant’s Causeway. Returning to Ballade, she had three other foals by her most frequent suitor Halo. This marriage of sorts created two males and two females. Two became champions on the track, one a champion sire, and another a grade one producer. Ballade’s sons by Halo are 1983 Eclipse Award Champion Two Year Old colt Devil’s Bag and 2005 leading North American sire Saint Ballado. Devil’s Bag was considered by legendary trainer Woody Stephens as one of the most talented colts he ever had. He was named as the Eclipse Award Champion Two Year Old in 1983. The colt unfortunately broke down with a fractured knee just before the Kentucky Derby. Devil’s Bag was sent to stud following his surgery to Claiborne Farm. He was syndicated for $36 million. Devil’s Bag had some success at stud, though not to the level anticipated by his syndicate members. Among his forty stakes winners are Devil His Due (Wood Memorial, Suburban Handicap twice, Pimlico Special, Gulfstream Park Handicap) and Twilight Agenda (Meadowlands Cup). Saint Ballado was a great loss when he died far too young at the age of thirteen. He had somewhat crooked front legs, which no doubt led to his low final price of $90,000 when auctioned as a yearling. However he did not pass this trait on to many of his get. Saint Ballado sired fast athletes that could win important races over a distance of ground. He was the leading sire in North America in 2005, posthumously. Saint Ballado is the sire of multi champion Ashado (Breeder’s Cup Distaff, Kentucky Oaks, CCA Oaks, Spinaway Stakes, Beldame Stakes etc) , major stakes winners Captain Bodgit (Florida Derby, Wood Memorial), Sister Act (Hempstead Handicap), Sunriver (Hollywood Turf Cup) and Yankee Victor (Metropolitan Handicap). The best offspring by Saint Ballado was undoubtedly his son Saint Liam. Saint Liam won four grade one races in 2005, the Breeder’s Cup Classic, the Woodward Stakes, Donn Handicap, and the Stephen Foster Handicap. He was off to a hot start as a sire but he too would become another tragic early loss to breeding. The 2005 Eclipse Horse of the Year died from the complications from a fractured tibia in his left hind leg. Saint Liam had stood for only one season at Lane’s End Farm, when he had to be humanely euthanized. The son of Ballade broke his left tibia in a freak accident. Veterinarians unfortunately could not repair the damage. He did leave us a 2011 Eclipse Award Horse of the Year in Havre de Grace. This excellent mare won the Apple Blossom Handicap, Beldame Stakes and beat a stellar field of males in the Woodward Stakes. In 2012 Havre de Grace was sold at the Fasig-Tipton November Breeding Stock sales for ten million dollars. Ballade produced another daughter that became a stakes producer herself. Angelic Song, the fourth offspring sired by Halo, produced Sligo Bay by Sadler’s Wells. A grade one winner of the Hollywood Turf Cup, Sligo Bay is in the early years of what is becoming a successful career as a sire standing at Adena Springs in Ontario. He is the sire of current Canadian Horse of the Year Lexie Lou, winner of the Queen’s Plate, Woodbine Oaks, Wonder Where Stakes and a bang up second to North American Horse of the Year California Chrome in the Hollywood Derby. His offspring are currently in demand at yearling sales in Ontario and Kentucky. There are other foals produced by Ballade that have had an impact in the breeding world. Manshood, a bay son of Northern Dancer, became a stakes sire in Australia with a good record. Nosferatu by Vice Regent was a short lived champion sire of stakes winners in Barbados, and his full sister Thaidah is the winner of the City of York Stakes. Such was the reputation of Ballade, her exceptionally handsome dark bay son by Northern Dancer foaled in 1983 brought a final bid of $8.25 million as a yearling. The unpredictability of thoroughbred breeding, the colt named Imperial Falcon won only two of three races, none of which were stakes races. He was given a chance at stud, and was supported quite well in the beginning. However he did not sire anything of noteworthy importance, although a few were minor stakes winners. Ballade is one of the honoured Windfields horses buried in the main cemetery in Oshawa, Ontario. This is the site of the former farm which is being preserved by the current land owners. Ballade is within a short distance from Northern Dancer’s grave, one of her suitors during her successful breeding career. However through the offspring by her most frequent mate, the fiery Halo, the name of Ballade is firmly etched into the pedigrees of some very fine and successful stars of today. Honoured as the 1992 Canadian Broodmare of the Year, Ballade was a light boned, elegant lass. She had good length in her body and possessed a wonderful temperament. She was able to transmit her good genes to some very notable foals. They in turn have carried on the family fortunes. Ballade died in 1994 from old age. I have a fond memory of her when she was at Windfields watching her with one of her foals. The foal in question would turn out to be Thaidah. Ballade seemed a caring and attentive mother. This is only fitting for a mare that has had a profound effect on the breeding world. Ballade, mainly through her son Nosferatu and also through Rahy, has had a remarkable impact on the breeding and racing industry in Barbados. Her descendants have won multiple Barbados Derbies, two Barbados Triple Crowns, two Barbados Sandy Lane Gold Cups, another that passed the line first in the Gold Cup but was disqualified, after winning by about four lengths. In Barbados in 2018 her descendant Gandalf, passed the line first in all of the Triple Crown races, but was disqualified in one. Another of her descendants, Janak (through Rahy), has been champion sire in Barbados for a few years. Her grandson Incitatus, a son of Nosferatu, actually won the Gold Cup in Barbados, then went to Canada, where he won the Connaught Cup (GR2) in 1999 and in 2000 winning the King Edward Challenge Handicap (GR2), beating among others, Quiet Resolve.